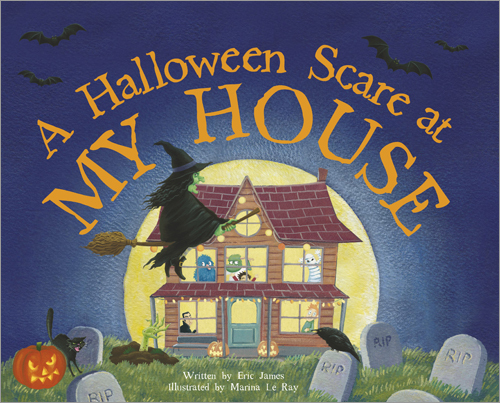 *A Halloween Scare at My House* by Eric James Spotlight with Giveaway! The perfect gift for every child or kid-at-heart who also loves celebrating the most eerie and thrilling night of the year, theHalloween Scare regional series offers a jaunty tale with a humorous bent—sure to ward off any creature who goes bump in the night in cities and states across the country! Now with 78 titles highlighting different cities, states, and regions in the U.S. and Canada, each book in the Halloween Scare series features art and text created especially for a specific state or city. Fun Halloween creatures and critters haunt your favorite landmarks, including famous sites like the Statue of Liberty in New York, California’s Hollywood sign, the Mackinac Bridge in Michigan, Georgia’s Okefenokee Swamp, Churchill Downs in Kentucky, the San Jacinto Monument in Texas and the Cape Hatteras Lighthouse in North Carolina. With its bouncing rhyme, colorful illustrations, and funny story, the Halloween Scare series is a delightful Halloween adventure for everyone who loves a silly, spooky tale. It’s perfect for younger readers who can explore their state or city and little learn more about the places and landmarks that make their homes unique. A night of pure terror to whiten your hair. A tale full of sights that are best left unseen. You ready? You sure? Eric James is a children’s book author, word tickler, and champion asparagus thrower. You can find him online atwww.ericjames.co.uk. He lives in Bath, England, with his family. Marina Le Ray has had success both as a children’s book illustrator as well as a greeting card designer. She lives and works in Nantes, France.